Welcome to the Tee House. We have 4 full size beds. 1 hide-a-bed sofa, and a large sleep sofa. They are in 3 rooms (suggested maximum of 6 adults). 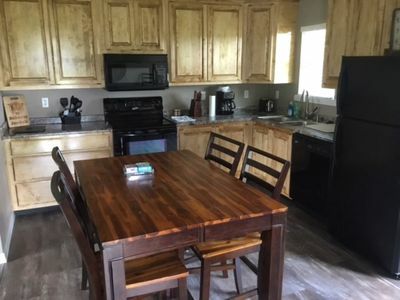 We have 2 full bathrooms, living room with 65" TV/DirectTV, Full laundry room, dining room, kitchen, deck with grill and dining table , CenturyLink Wi-Fi, towels, linens, pillows, dishes, silverware, cookware, and coffee are all included on site. Golf cars and chargers can be accommodated upon request. No pets/ No Smoking. Our $135 rate is for the first two occupants and $30/person after that up to 6 occupants. 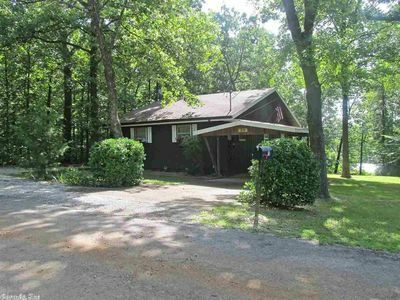 Enjoy this cozy Lake Thunderbird home that will accommodate up to eight comfortably. One night rentals may be considered contact me. 2 bed 2 bath. Located on a quiet cove that is great for kayaking, fishing, swimming, and boating (rent from marina). Beautiful screened in porch that over looks the lake. Quiet street, wifi, Keurig machine, washing machine and dryer, microwave, iron, bbq grill, fishing pole, kayaks, water guns, TV in living room and all bedrooms. Bunk bed room with two sets of a full and a twin. Large lot provides a lot of shade. Dvds, books, and games available. Bring your fishing pole and just fish from the dock if you have your Arkansas license. Rent a boat and enjoy the lake steps from the door. Great nearby restaurants and bowling. Nearby community center has a pool and mini golf. You also have access to two great golf courses and hiking trails. Visit the town square to see a waterfall. Property is agent owned. Bookings subject to confirmation. No smoking. No pets. No lifeguard on duty. Owners are not responsible for bodily harm as a result of any activity inside or outside including but not limited to fishing, kayaking, boating, swimming. These activities occur at your own risk to you and your guests. Breakfast not provided. 4 bedroom, 3 bath 2 level home right on the lake. We also have a separate room with air hockey and a sleeper sofa upstairs . This house has the best view. The kitchen and baths are well stocked. Very comfortable home. 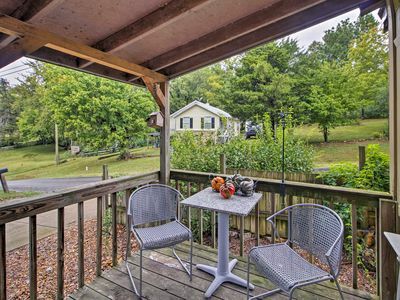 Walk out on the full length deck and enjoy the view with a morning coffee, or go downstairs and sit on the porch swing and enjoy serenity. The downstairs bath even has a Jacuzzi tub to rewind after boating all day. We have charcoal grill and fire pit outside to enjoy. WIFI provided.,NO SMOKING!!!!!!!!!!!!!!!!! We have a paddle boat and 2 kayaks for your use. Please remember to remove from lake. Charming-Quiet-Non- Smoking, Private 3 Bedroom , with fold out couch. 1 bath, mid-level Unit Lakefront rental in Cherokee Village Community. Fully Furnished with Private Back yard, storm shelter in basement with overlooking Lake Thunderbird. 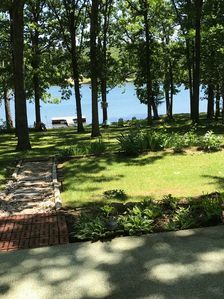 Backyard access to the Lake and the dock with pontoon rental available by appointment per day . Quiet place to get away from home and enjoy the lake and its private and far away from our stressed world. Boating, swimming, Golf, zip line, and hiking or just a Quiet time for a couple... ** If you have a special event, Anniversary, Birthday or such, we do offer a gift basket for $25.00 that includes 2 wine glasses a bottle of wine or non alcoholic drink, fruit, cheese, and individual candies, and a rose. * please let us know 24 hours in advance. 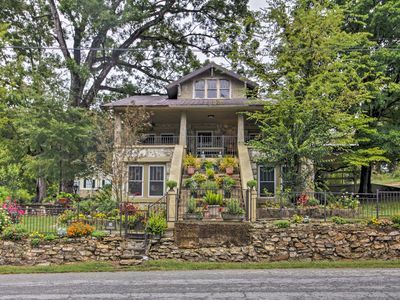 ATTRACTIONS The Lake Home is only minutes from Historic Main Street Hardy, The Spring River and Restaurants. Popular are the Ice Cream and Gourmet Coffee shops. Art Museums, Antique stores and live music shows. The Spring River offers canoe rentals and parks for the whole family. Cherokee Village is a Family Friendly Community that offers Natural Ozark Beauty, 2 Private 18 hole golf courses, 6 Swimming pools, Private beach and tennis courts. 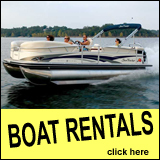 Canoe rentals and RV parks are nearby. The Lake home was built in 2010 and have a charm it selves, and you will find yourselves at home when you hit the front door. WiFi and TV/DVD. Just a block from downtown Cherokee Village. Short distance to Walmart and all you need for your stay. Check in is at 2 pm and check out is 10 am. If it is determined to need excessive cleaning when checked out, a cleaning fee will be deducted from refundable deposit. Beautifully decorated with very large open floor plan(1500 sq. feet).Flat screen tvs,pillowtop mattresses,towels,linens,all pots and pans,silverware and utensils,Netflix,canoe,large back deck,gas grill,Everything you need supplied but our food.Beautifully decorated with very large open floor plan(1500 sq. feet).Flat screen tvs,pillowtop mattresses,towels,linens,all pots and pans,silverware and utensils,Netflix,canoe,large back deck,gas grill,Everything you need supplied but our food. 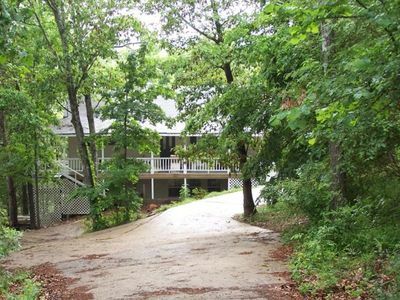 Lakefront Sequoyah home is available for the night OR week. $270/two night min. plus tax, with a minimum 3 night reservation on holidays, for 2 people; or rent by the week with the 7th night free! EACH ADDITIONAL PERSON IS $10/NIGHT PER PERSON. Credit card/deposit to hold reservation required. Cancellation fee applies. Satellite TV, DVD, WIFI, charcoal grill, fully furnished and supplied, so just bring your clothes & food! 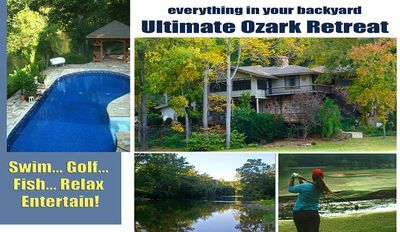 Best Fishing, Golf & Family Fun in the Ozarks! Custom home on the prime spot of the South Fork of the Spring River, right across from the pro shop, tennis courts and 1st, 10th & 18th holes of a championship golf course. With your own lo-chlorine private pool! Perfect for a family get-together to celebrate special events, with large decks and plenty of room for entertaining, sleep & play. 3 acres of seclusion, with no neighbors around, for quiet peace & relaxation. The space 3 Acre Private Utopia on S Fork of sparkling Spring River with pool. Great fishing, golf, canoeing, floating, peaceful nature aplenty. EZ walk across bridge to pro shop, tennis courts, holes 1 10 & 18 of champion golf course & Raccoon Springs. This executive retreat is surrounded in privacy & simple luxury amid Nature's beauty. The private pool is lo chlorine / saline so its gentle on your hair, skin and eyes. This spot on the river is a best-kept secret with fishermen. The South Fork is quiet - yet links into more challenging adventures and swim spots on Spring River - you can float or canoe for hours downriver. The golf course is private, so guests can get right on the 1st or 9th tees, usually without reservations. Just walk across the bridge to get to the pro shop (right next to the tennis courts & practice range) grab your cart & ride! Or stroll the course walking paths to pretty Raccoon Springs. 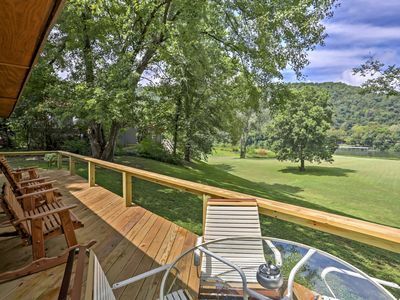 Views are spectacular & peaceful from rooms, decks & 3-sided open-air porch. You can hear birds chirping, watch turtles, & chuckle at golfers trying to hit across river to your elevated 10th green, while you're tucked high in the trees. The 4,000 sf home was designed retreat style, with lots of natural stone & wood. Plenty of room to play, sleep & entertain. One tv in the large master bedroom, which also has a couch for your kids or friends to flop on & watch with you -- another 50" tv in the rec room, and a third, just added, in living room. The freshly remodeled kitchen features a JennAire gas grill-top built-in that grills the best steaks, fish, chicken & veggies. The kitchen is just a few steps from the decks and huge screened-in porch. Charcoal BBQ with comfy couch seating & dining area under deck. Amazing to find such a sweet retreat in this part of the Ozarks! Guest privileges for use of private golf course at low daily fees, full use of private swimming pool, simple access to river canoe launch pad. We aim to be the best location for your special family get-togethers, your special retreat away from home. Thanks for checking out our lake house! 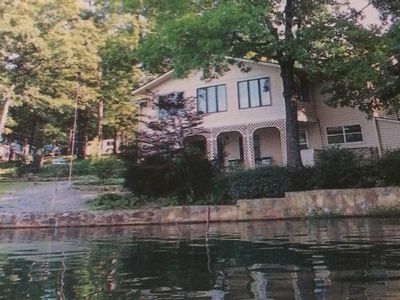 Come and enjoy our home located on Lake Sequoyah in beautiful Cherokee Village. The property is a 4 bedroom, 2.5 bath 3 level home with 2 fireplaces. There are 2 living areas, each with a flat screen TV and it sleeps 10 (6 adults maximum). All of the paper products, bed linens, fully equipped kitchen are provided. Beautiful views from the home with a large backyard leading to a private boat dock that is great for swimming. Boats are available for rent at the local marina. There are 2 kayaks in the garage for your use. Honestly too many amenities to list. Please email for more details! Welcome to Grizzly Hill! 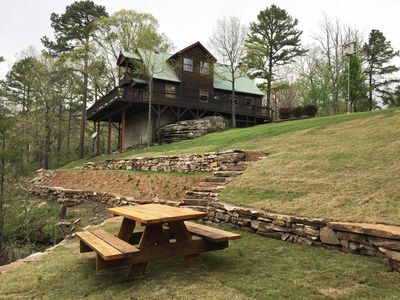 Nestled in the hills of Spring River country in the Ozark Gateway., Grizzly Hill cabin offers sweeping views of tranquil Lake Sequoya while dining, grilling or having coffee or cocktails on the wrap-around deck. Are you ready to unplug for a weekend of relaxation or fun?! 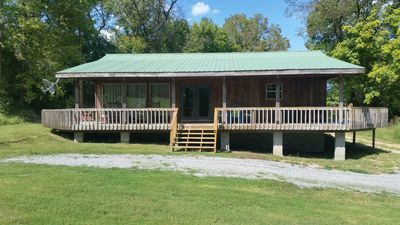 More information The space The cabin features all of the modern conveniences of the city with the beautiful landscape of the Ozarks. 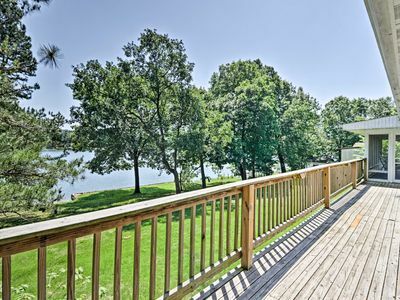 Relax in a spacious, open living area that floods out into nature on the wrap-around deck on beautiful days or stay cozy and warm inside watching movies or playing games. Roast s'mores by the fire after feasting on dinner from the grill or prepared in the conveniently stocked kitchen. Spread out for some R&R in two large, comfortable bedrooms with plenty of room for your belongings. The cabin is equipped with wifi throughout should you need to connect to world, but we're guessing you won't think twice about those work emails once you arrive! Plenty of space for extra parking or camper/boat parking on the north side of the cabin. Interaction with guests We are happy to assist with any guest needs. While we will not be in the immediate area, we do have hosts in Cherokee Village for assistance. Luke’s home is located in Cherokee Village, Arkansas, United States. 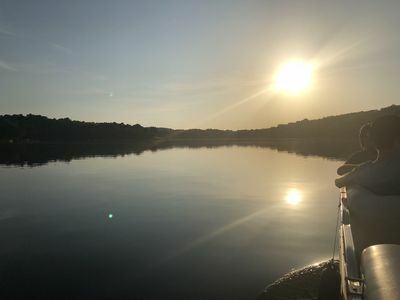 Visitors also have access to all that Cherokee Village has to offer, including: 7 Lakes -Grizzly Cabin is situation between Lake Thunderbird and Lake Sequoyah. This makes for a convenient location to launch your own boat or rent one for the day from Thunderbird Marina. Add taking a dip at Gitchee-gumee swimming beach on Lake Sequoyah to your list as well! 6 Swimming Pools 2 Golf Courses 4 Tennis Courts Fitness Center More information Grizzly Hill is only 8 minutes from downtown Hardy! This makes it easy to pack up snacks and drinks for the day, go to one of the many river outfitters and float the Spring River! Waltz Inn is beautiful and spacious with cleanliness a priority. 1800 Sq ft of space to relax and enjoy your stay in. When you finish your day of floating, boating or swimming in our beautiful (7 lakes, 2 rivers) you can enjoy a barbecue on the deck, then relax and dine in the screened sun room with tables to accommodate your dinner while you view the peaceful back yard below and catch a view of wildlife from time to time. Deer have a regular path they follow through the yard. You can rent a party barge for a day or 1/2 day on beautiful Thunderbird Lake only 1 1/2 miles away, or float South Fork River 1/8 mile away. You can bring your own boat there is a launching ramp for each of the 7 rivers on Cherokee Village; also plenty of parking space at Waltz Inn for your boat or guests. Rise early and shoot a few rounds of Golf, you are only a block away from the North Golf course which offers 18 holes of professional style golfing. When you finish golfing you can take the family to Thunderbird Recreation Center where you can play mini golf or swim in the large swimming pool overlooking beautiful Thunderbird Lake. We live close to Waltz Inn so we are available to assist in any way we can to assure you have a pleasant as well as comfortable stay; we can be reached by telephone or e-mail. We are proud of Cherokee Village and want others to have the privilege of enjoying the same relaxed atmosphere we have enjoyed. Downtown Cherokee Village offers a walk up Papoose Waterfall which is a spill off from Cherokee Lake. Sequoia Lake is above Cherokee Lake and has a channel leading to Thunderbird Lake. You can boat Thunderbird lake, go through the channel and be on Sequoia Lake. If shopping is your thing you can go to Ole Hardy Town, 5 miles away, and shop its numerous flea markets or antique shops as well as browse other shops for unique items. Hardy also offers Various types of craft malls to purchase that unique item for the hard to buy for person. Whether water sports, golfing, shopping or dining is your passion Cherokee Village has it all and Waltz Inn is a once in a life time place to stay. We are within 16 miles of Mammoth Springs, AR which offers Dam 3 Fish Hatchery, one of only 3 of its kind in the world; Germany and England have the only 2 other facilities of this type raising fish. Fish Spring River for trout where there are several hundred trout released into the river twice each week. 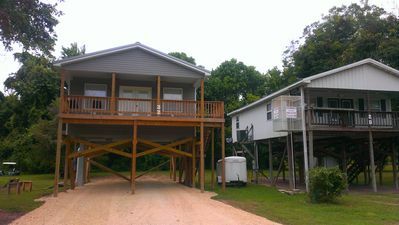 Cabin built on stilts (lift not included) with large front porch clear views of the spring river and only a few steps away from Fishing , swimming ,canoeing or floating. No hidden charges no cleaning fee added. All of the luxuries of home charming but simple, air conditioned ,satellite TV , Wireless Internet two bedroom, two bath cabin showers only , a fully equipped kitchen, and sleeping space for 6 queen size beds in both rooms along with a queen size sleeper sofa. Local Outfitters rent your floating equipment they will pick you up at our house and you will float right back to the house. Were also approximate 9.5 miles from Many Islands On Spring River. We use a code Key system so you wont have to keep up with keys while out having fun on the river. In the photos of the house you will see a Boat launch this is just left of our house and you will have easy river access for your enjoyment. Spring River just down from Low Water Bridge. Campers are all too familiar with the early morning swims in the refreshing waters of the Spring River. If you love canoeing, the Spring River with its Class II, Class III rapids, s-curve shoots, and some three foot falls is the place to be. A Canoe trip on the Southfork or on the Spring River itself provides a great escape into nature and an exciting ride. All you anglers, the Spring River is noted for its plenteous rainbow trout! Nothing like fresh fish for supper! You would rather horse back ride at Lazy Acres Riding Stables ,play golf or tennis? Those venues are close by. Are antiques your weakness? Hardy is your bit of heaven as antique stores abound in the Old Hardy Town. And talk about food? We have the all Home Country Cooking or your choice of fast foods. Wal-Mart Super Center is just around the corner. There's lots of places to go, things to do or just sit, relax and chill out. McDonalds, Taco Bell, Pizza Hut and Kentucky Fried many local spots. Come to Hardy, come to the Ozarks; Come relax in my cabin! NEW! Hardy Guesthouse Walk to Historic Downtown! 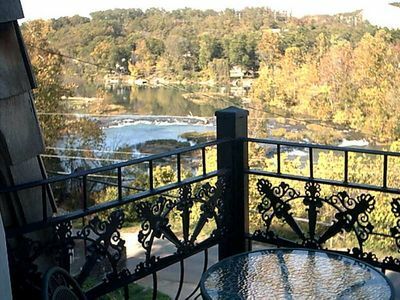 Come enjoy the beautiful sunsets off your balcony porch overlooking the river and be lulled into a relaxing state while listening to the water flowing over the rapids below. You will be steps from access to the river and walking distance from the Bufford Beach Park with swimming, play, and picnic areas and a boat launch. Property is located within minutes of 'old town" Hardy, a step back in time, with antique and specialty shops, craft stores and gift nooks. This charming French vacation property is situated on a wooded hillside landscaped with private patio areas surrounded by gardens and a hillside stream that gently flows into a stocked koi pond. Lose yourself in the quiet and relaxing atmosphere in the well manicured grounds with seating throughout. 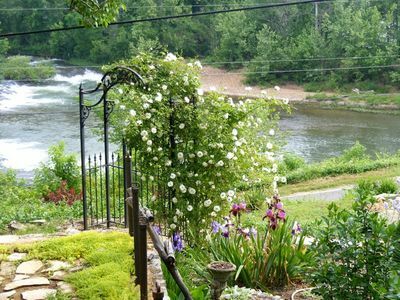 This property is the perfect location for an intimate wedding, family vacation, reunion or retreat, to spend a honeymoon, anniversary or a romantic getaway, or the perfect base for fishing, canoeing, or rafting. These nightly/weekly rentals are the perfect place for you in historic "old town" Hardy. Rustic stone Manoir, with a private entrance and grounds, was built in 1930 with private outdoor patio fireplace and seating area perfect for gatherings under the stars. Make s'mores or enjoy grilling with family and friends. Villa has two bedrooms with a full kitchen completely furnished. The living room has a romantic fireplace, large flat screen T.V. with Dish and DVD/VHS. Step into luxury in the master suite with a marble counter top and walk in shower. Beautiful arched stone architecture on the lower patio is situated underneath the spacious balcony above that is ideal for outdoors meals and while enjoying the scenic beauty from the river below. Come enjoy the beautiful sunsets off your balcony porch overlooking the river and be lulled into a relaxing state while listening to the water flowing over the rapids below. You will be steps from access to the river and walking distance from the Bufford Beach Park with swimming, play, and picnic areas and a boat launch. Property is located within minutes of 'old town" Hardy, a step back in time, with antique and specialty shops, craft stores and gift nooks. The Rustic Lodge Features 3 bedrooms and can sleep up to seven. Bathroom has a charming claw foot soaking tub with an in-tub shower. The large kitchen, dining, and living room area all have beautiful views of the river. 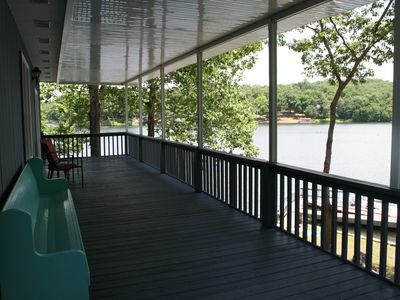 A large deck off the front of the house also provides views of the river falls below. The Spring River is just steps away for great fishing, swimming, canoeing, and kayaking. This charming French vacation property is situated on a wooded hillside landscaped with private patio areas surrounded by gardens and a hillside stream that gently flows into a stocked koi pond. Lose yourself in the quiet and relaxing atmosphere in the well manicured grounds with seating throughout. This property is the perfect location for an intimate wedding, family vacation, reunion or retreat, to spend a honeymoon, anniversary or a romantic getaway, or the perfect base for fishing, canoeing, or rafting. These nightly/weekly rentals are the perfect place for you in historic "old town" Hardy. Waterfront Home on Lake Sherwood w/ Dock & Deck! Note: We also have a smaller cabin for 2 adults downstream from this cabin on another gorgeous PRIME waterfront location--just ask us or go to www.vrbo.com/7195532ha ============================ We can sometimes offer same-day check-in depending on circumstances--click on "Ask Owner A Question" on the VRBO Inquiry Page after you enter dates. ============================= Please note that rate is for party of 2--each additional guest is $10 per night, and cleaning fees are $100 for party of 2/$125 for 3-4/$150 for 5+. VRBO does not have an option for varying the Cleaning Fee, so I will make the correction in the rate quote if your party is more than 2 people. 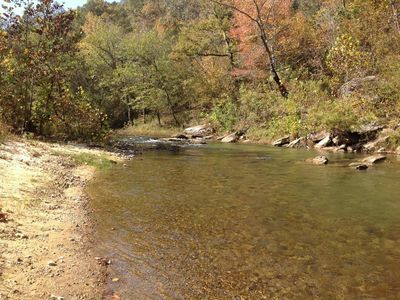 VERY REMOTE & PRIVATE CABIN ON PINEY CREEK WITH SANDY BEACH--PINEY CREEK IS A YEAR-ROUND BEAUTIFUL STREAM WITH GREAT FISHING. LOCATION IS CALICO ROCK ARKANSAS. 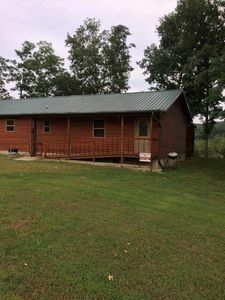 FULLY FURNISHED CABIN -8 MILES OUT OF CALICO ROCK SITTING RIGHT ON PINEY CREEK AND ONLY 2 MILES FROM EASY WHITE RIVER ACCESS (WORLD CLASS TROUT FISHING). 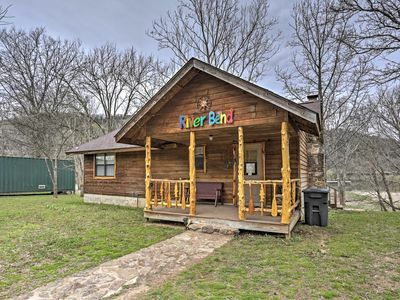 CABIN IS ABOUT 45 MINUTES FROM THE FAMOUS OZARK FOLK MUSIC CENTER, BLANCHARD SPRINGS CAVERNS, LOCO ROPES, AND OTHER SCENIC WONDERS IN MT VIEW. DON'T FORGET THE VERY POPULAR BEAN FEST IN MOUNTAIN VIEW, AR AND THE 55 MILE YARD SALE! HEY, BRANSON IS ONLY 2.5 HOURS!!!! GORGEOUS 1200' CREEK FRONTAGE WITH EASY SANDY ACCESS TO CREEK FOR PLAYING, FISHING, FLOATING, KAYAKING, OR SIMPLY WATCHING NATURE AT ITS BEST! WONDERFUL FOR KIDS TO PLAY, LEARN TO FISH, SWIM AND JUST BE KIDS. HEY, PARENTS--IF YOU ARE INTERESTED IN SEEING YOUR KIDS LEAVE THE "TECH WORLD" AND GET OUTSIDE TO CONNECT WITH NATURE, THIS IS THE SPOT! CRITTERS GALORE! CREEK IS ONLY 200' STRAIGHT OUT FRONT OF CABIN! WOW!!! NOTE: ALL THE FISH SHOWN IN THE PHOTOS WERE CAUGHT RIGHT ON OUR PROPERTY! 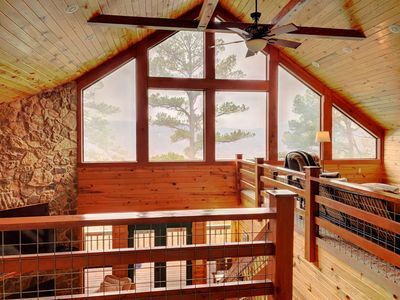 If you’re considering another vacation rental cabin, don’t! Our property offers the ultimate nature experience! A beautiful pristine creek, wooded paths, towering limestone bluffs, abundant wildlife, and serenity await you at this remote, quiet getaway. 2 PICNIC TABLES, BBQ GRILL, AND A FIRE PIT OVERLOOKING THE CREEK. FREE PROPANE FOR GRILL AND FREE WOOD FOR FIRE PIT! Just kindly leave the grill as you found it--nice and clean! 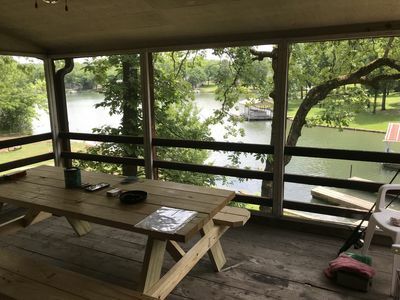 CABIN IS FULLY FURNISHED--ALL YOU NEED IS YOUR PAPER PRODUCTS, LAUNDRY DETERGENT FOR YOUR PERSONAL USE (WE PROVIDE THE LATTER FOR LINENS), FISHING POLE, YOUR KAYAK OR INNER TUBES, AND PERSONAL ITEMS. HAS 1 KING BED, 1 QUEEN BED, AND 4 TWIN BEDS PLUS A REGULAR SOFA. WILL SLEEP 9 (8 IN BEDS & 1 ON SOFA). LIVING ROOM, DINING ROOM, KITCHEN, UTILITY ROOM, 1 KING BEDROOM AND BATH ON MAIN FLOOR. 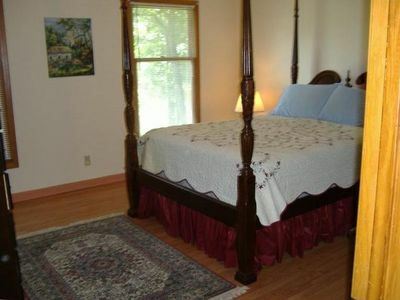 UPSTAIRS LOFT IS DIVIDED INTO QUEEN BED AREA AND 4 TWIN BEDS AREA WITH BATH BETWEEN. WASHER & DRYER, TRASH COMPACTOR, JENN-AIR GAS STOVE, REFRIGERATOR / TOP FREEZER, DISHWASHER, CENTRAL HEAT/AC, CEILING FANS, AND STAND FANS. BED LINENS, TOWELS, AND KITCHEN DISHCLOTHS SUPPLIED There is Satellite TV with DVD player so bring along your favorite movies. The cabin has a phone and internet with WiFi service. Most cell phones now have WiFi Calling, so you can probably pick up our WiFi signal to make cell calls. We cannot guarantee a cell signal; cell signals are very weak everywhere in the Ozarks; however, if you cannot access our WiFi signal with WiFi calling, we generally have good luck contacting the "outside world" on the front deck in the corner just in front of dinner bell and sometimes even at the creek, especially with iPhones. The intersection of Reb Lane and Boswell Rd usually has a good cell signal. Cabin does not have trash pickup--service is not even available in our area of the Ozarks--you will need to take your trash "home with you." This area of the Ozarks is very rural with dirt/gravel roads.. The last short part of the road to our cabin is ROCKY AND ROUGH. We STRONGLY recommend a 4-wheel drive vehicle--the higher the frame the better. The long driveway down to the creek and our cabin has "speed bumps"--not the normal kind--just erosion prohibitors. Go slow. 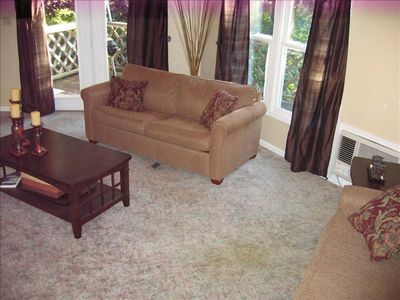 PLEASE NOTE: VRBO shows $100 for cleaning, but that is ONLY for a party of 2---rate increases with party size. WE REQUIRE A DAMAGE-LOSS DEPOSIT IN FORM OF CREDIT CARD INFORMATION HELD UNTIL POST-DEPARTURE INSPECTION OF CABIN. IF CABIN, CONTENTS, AND PROPERTY ARE LEFT IN GOOD CONDITION, WE HAPPILY SHRED YOUR CREDIT CARD INFO. THIS IS A STRICT NO-SMOKING (INCLUDING SMOKELESS TOBACCO AND E-CIGARETTES) NO ILLEGAL DRUGS, AND NO UNDER-AGE DRINKING CABIN. NO STUDENT GROUPS, AND ONLY REGISTERED GUESTS PERMITTED. NO ANIMALS OF ANY KIND ALLOWED ON PROPERTY. E-MAIL US FOR AVAILABILITY. PLEASE TELL US THE EXACT DATES YOU WOULD LIKE TO CHECK-IN AND CHECK-OUT PLUS THE TOTAL NUMBER IN YOUR PARTY INCLUDING THE AGES OF EACH CHILD (YES, EVEN INFANTS). WE CHARGE EXTRA FOR EACH PERSON (YES, EVEN INFANTS) OVER THE INITIAL PARTY OF 2. MAXIMUM CABIN OCCUPANCY IS 9 PEOPLE (REGARDLESS OF AGE). Two bedroom cabin with a cozy atmosphere. With all the amenities of home, including a two car garage, electric fire place, full kitchen , full bath, propane grill, screened in porch, all while sitting within a few feet of the Spring River. 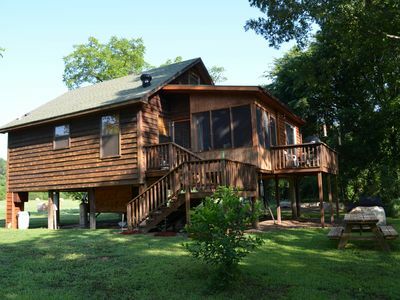 The cabin is ideal for a family vacation, trout fishing trip, or a romantic getaway. This is a fly fishermans paradise out your back door.The State and Federal Hatchery just a couple miles upstream, helping to make this property boast some of the best Trout fishing in the country. 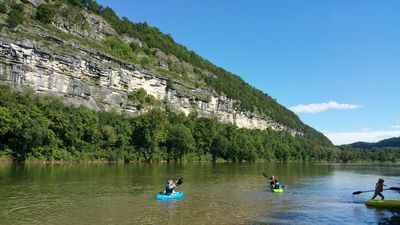 Spring River is also famous for canoeing and kayaking, with local outfitters ready to supply any of your boating needs. Spring River Landing also, has freshwater water lakes, stocked with Bass, Crappie, and Catfish. Guest are responsible for any and all fishing license and tags. 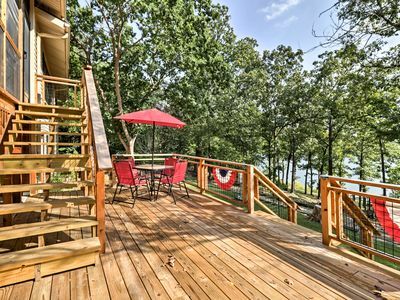 Luxury Cabin with breathtaking view overlooking Lake Norfork. 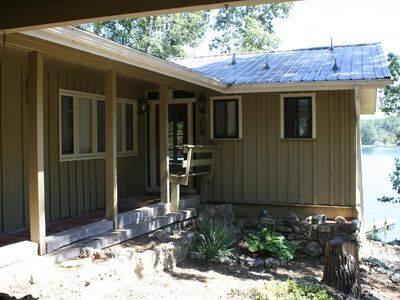 Come stay in this newly renovated cabin in beautiful Calico Rock, Arkansas. 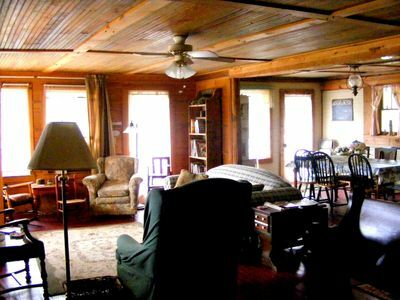 This two bedroom one bath cabin has everything you need to relax and enjoy everything this historical town has to offer. There is Direct TV and a DVD player for your indoor entertainment. The kitchen is fully stocked with everything you will need, minus the groceries. There is also a charcoal grill if you want to cook outside. If cooking isn't for you, we are just one block from downtown where you will find restaurants such as the Printing Press Cafe, Babycakes Bakery and Cafe, and Between the Buns diner. There are also two museums and the famous Ghost Town,? Peppersauce Alley, you can tour on your visit. 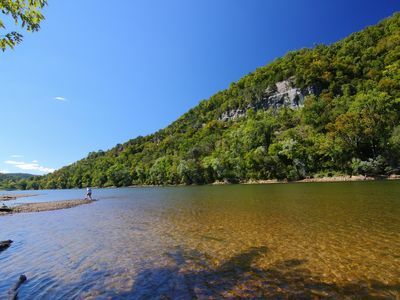 If trout fishing is what you have in mind, the beautiful world-renowned?? White River is just where you need to be! Our cabin is 1/4 mile from Calico Rock access and less than 4 miles from Chessmond Ferry Access. There are three boat docks to choose from at these accesses if you want to rent a boat, hire a guide, or just gas up your own boat! Calico Rock is located in the Ozark Mountains between Mountain View and Mountain Home, where there are many attractions as well. Lake Norfork is also less than 14 miles away if you prefer being on the lake. Come stay with us, you are sure to have a great time! Calico Rock Cabin-302 Chessmond Ferry Rd (406 Calico St) is a 3bedroom/2bath modern cabin situated on a Bluff Lot overlooking the White River with walkable bluff frontage featuring "killer views" of the White River and overlooking a 6500 acre working cattle ranch backgrounded by the 170,000 acre Ozark National Forest,Sylamore Ranger District. This modern vacation cabin includes a wrap around deck featuring a walkdown to the edge of the bluffs, a large drive in garage, all the modern amenities such as modern kitchen with dishwasher,washer/dryer,heated whirlpool in master bath, and big screen smart tv with wi-fi. 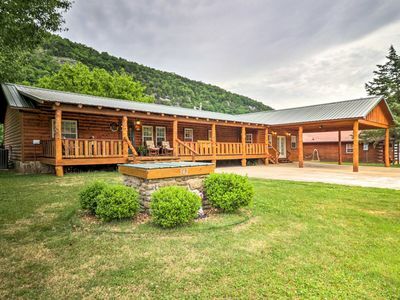 This vacation cabin is located 5 minutes from 3 trout docks with rental boats and guides for scenic touring of the river and trout fishing up and down the river from Calico Rock. 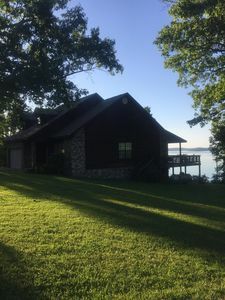 The property is also located within 30 minutes of Blanchard Springs Caverns Recreational Area and 30 minutes from Lake Norfork marinas(Quarry and Jordan). Numerous fine restaurants are in the immediate and nearby area such as Printing Press Cafe(Calico Rock),Subway(Calico Rock),PJ's White River Dining(Redbanks),JO JO's Catfish Restaurant(Allison),and Angler's Restaurant(Allison).This is the perfect location to enjoy the beautiful Ozark Scenery from the bluffs overlooking the White River while being close to trout fishing on the White River,boating on Lake Norfork, and exploring the Ozark National Forest with numerous hiking trails and nearby recreational areas such as Blanchard Springs Caverns Recreational Area. WiFi available at property for your internet devices along w/Big Screen Samsung TV & 150 channel Sat TV. Calico Rock Cabin-390 Chessmond Ferry Rd(500 Calico St) is a 3 bedroom/2 bath modern cabin situated on 1.62 acres with 261 ' of Bluff Frontage featuring "killer views" of the White River and overlooking a 6500 working cattle ranch backgrounded by 170,000 acres of the Ozark National Forest,Sylamore Ranger District.This modern vacation cabin includes all the modern amenities such as modern kitchen with dishwasher,washer/dryer,whirlpool in master bath, and big screen tv with 150 channels. 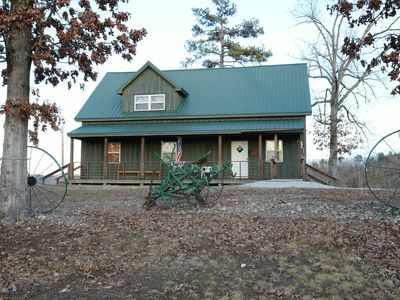 This vacation home is located adjacent to the Calico Rock water tower 5 minutes from 3 trout docks with rental boats and guides for scenic touring of the river and trout fishing up and down the river from Calico Rock.The property is also located within 30 minutes of Blanchard Springs Caverns Recreational Area and 30 minutes of Lake Norfork marinas (Quarry and Jordan). 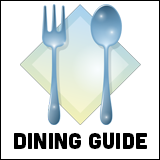 Numerous fine restaurants are in the immediate and nearby area such as Printing Press Cafe(Calico Rock),Subway(Calico Rock),PJ's White River Dining(Redbanks),Jo Jo's Catfish Restaurant(Allison), and Angler's Restaurant(Allison). 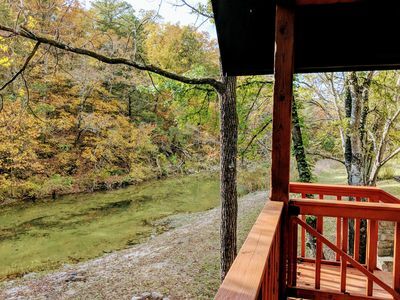 This is the perfect location to enjoy the beautiful scenery from the bluffs overlooking the White River while being close to trout fishing on the White River,boating on Lake Norfork, and exploring the Ozark National Forest and nearby Blanchard Springs Caverns Recreational Area. 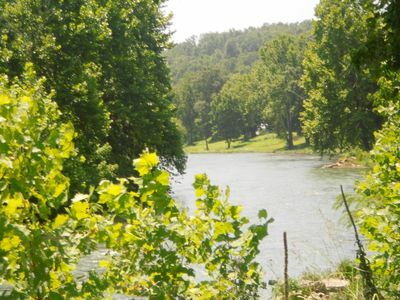 Our cabin is located on the bluff overlooking the White River. 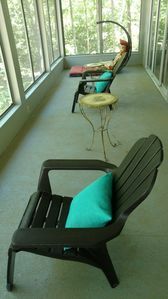 Enjoy morning coffee on the deck in the midst of the river fog or relax in a lounge chair and watch the sun set. The interior of the cabin features great views from the living/dining area, master bedroom, and kitchen. The cabin has three bedrooms - one with a king; one with a full; one with two twins. The master bedroom has an en suite. WiFi is now included. Many outdoor activities nearby including trout fishing, horseback riding, and hiking. FISH TALES on the White River ... come enjoy a little paradise!! This home has just gone through a complete remodel and is the perfect destination for a dream vacation. No expense was spared in this small but luxurious home. 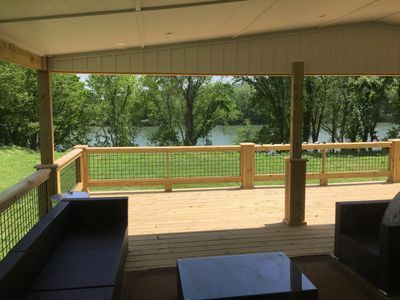 There is a large covered deck with comfortable furniture and dining table for you to watch the river go by, or watch the outdoor TV and catch up on the latest. This opens to a large open deck for those sun lovers! On the lower deck you will find a gas grill, charcoal grill, and fish cooker. There is lighting and plenty of seating for everyone to gather, and steps lead down to the fire pit. The kitchen is fully equipped..all new cabinetry and.appliances, just bring your food!! The living area is modern, spacious, and soooo comfortable. From the beautiful scenery from the large windows, the curved television to not obstruct your view, and the comfortable furnishings, it is relaxation at its best. One of the 2 bedrooms has a king bed with a luxurious mattress, and a set of built in bunk beds, the other has a queen bed with a set of built in bunk beds, yet there is still plenty of room in the bedrooms! There are 2 full bathrooms, one has a shower/tub combo, the other has a tile shower. We hope you will feel that you have all the comforts of home! You can access the river from the house, there is a landing with steps down to the water . This is the deeper side of the river, and there is a swift current during high water levels so swimming is not advised even when water levels are low... this is trout water and it is very COLD!!. Just down the road is a boat dock with boat rentals, and a public ramp if you prefer to bring your own boat. The town of Calico Rock is just a minute away, with a few restaurants, grocery and hardware store and historic downtown main street. . 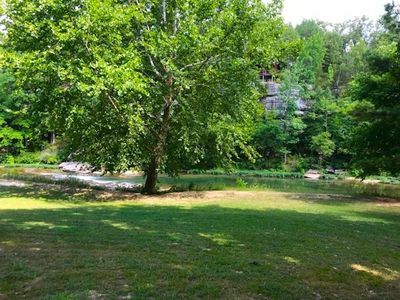 The town of Mountain View is a short drive down the road, with numerous attractions... Blanchard Springs caves, Loco Ropes, and folk music on the square just to name a few. At the house you will find information on local attractions, and always feel free to contact me to see how we can make this your dream vacation! PRICING: The nightly price is for the first 4 people. Additional guests are $25 per person per night. 3 night minimum stay for holiday weekends! Our private riverfront home is the perfect location for relaxing, fishing, floating, or canoeing. 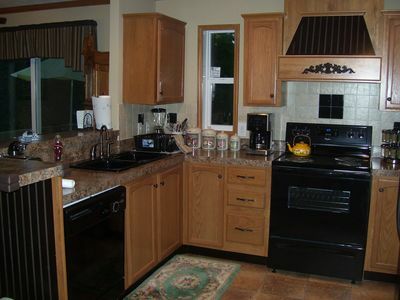 The kitchen is fully accommodated, just bring the groceries, and there is a laundry room for longer stays. There are 2 bedrooms downstairs with full size beds and a full bath with a shower. The upstairs bedroom has a king size bed and a full bath with tub shower combo. The living and dining area is spacious and open. The large deck is covered with cedar rockers and a cedar picnic table for extra seating. Also located on the deck is a Weber Performer Charcoal Grill with propane start. The yard is mowed to the river. There are multiple places to sunbath. We are on the shallow side of the river, depending on water generation you can fly fish or play and splash around or if you are out fishing and want a break toss your anchor on the bank and walk to the house. Mtn. View is 25 miles away with numerous attractions, shopping, and activities. Explore Ozark Folk Center State Park, Blanchard Springs Caverns, Loco Ropes Theme Park, Syllamo Mtn. Bike Trails, and much more. If you bring your own boat the boat ramp is just 2 miles from the house and there are several outfitters in the area. Pricing is for the first 4 people additional guests are $25 per person per night. Pricing is discounted for 7 nights or more. Situated in a beautiful valley, this cozy cabin backs up on the White River at the point across from the spectacular Handford Bluff. The cabin has a fully accommodated kitchen and laundry room for longer stays. The cedar wrapped, 40 foot back porch is screened and has four ceiling fans for your comfort in the summer and a small unscreened area with a charcoal grill. There is a fire pit in the back yard. Inside, there is Direct TV, Wi-Fi and DVR available. 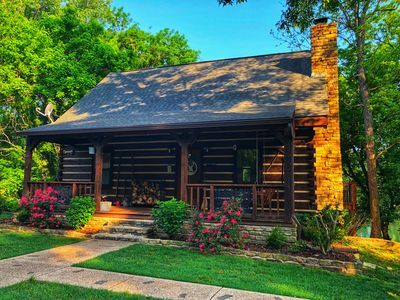 Whether you are coming to Mountain View for the folk music and Ozark folk culture, or you are just looking for a peaceful, relaxing getaway with a variety of recreation options nearby, this could be the place for you. There is a stairway behind the cabin providing easy access to the river for fishing or other water related activities. There is a good place on the rocky beach area behind the cabin to put a Kayak into the water if you would like to make the beautiful, approximately 2 or 3 hour float from the cabin to Guion public boat access. The cabin accomidates 6 guests and there is an additional fee for any approved extra guests. Our Cedar Cabin is a 2 bedroom, 1 bathroom handicap accessible cabin - extra-wide doors, ramps, roll under sink, wide paths throughout the cabin. The bathroom has grab bars at the potty and in the shower (shower chair available, if needed). 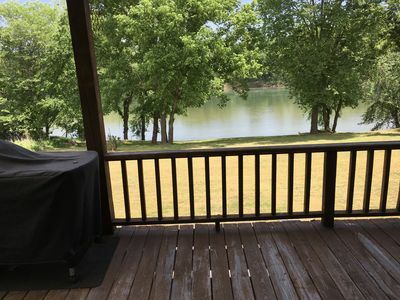 We have a large screened in porch with two tables, and a spacious deck overlooking the White River. Our kitchen is fully furnished. Just outside on the deck, you will find a charcoal and a gas grill. We provide your linens, and just about anything you would need. Also, our Cedar Cabin comes complete with DISH satellite TV. Come get away with us and relax on the river. If you don't see something, just ask. 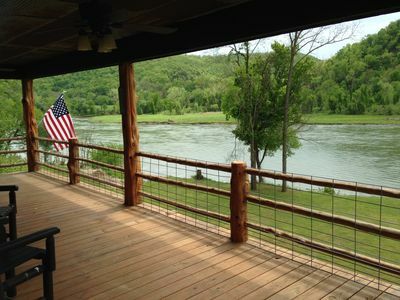 Come enjoy the peace and tranquility of this home over looking the White River. Easily access the river bring your boat and enjoy some fishing. Go to the Ozark Folk Center and enjoy some blue grass music. Also enjoy the music at the Court House Square. Go explore Blanchard Springs Caverns. Handicap Accessible. Quiet secluded, Mother Nature, Main Level Bedroom with Queen Size Bed, Upstairs Bedrooms, Bedroom 1 with Queen and Double, Bedroom 2 with Double and 2 Twin Beds, Fully furnished kitchen, New house never been lived in. Satellite TV, Porches to enjoy the views. Quiet secluded location with elegant surroundings. 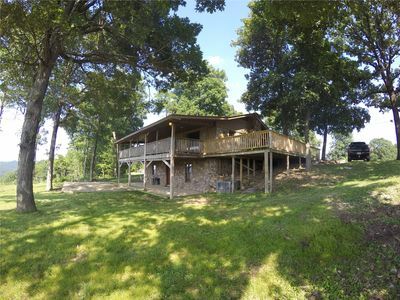 This home is located in the Ozark National Forest on 4.5 beautiful acres. It has all you need for a family getaway or a romantic weekend. The house has three bedrooms, two baths and sleeps a total of 9. 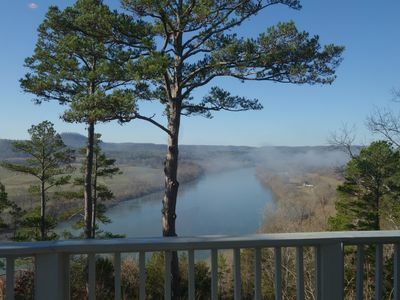 The property has much to explore and a beautiful panoramic view of the White River is just steps across the street. 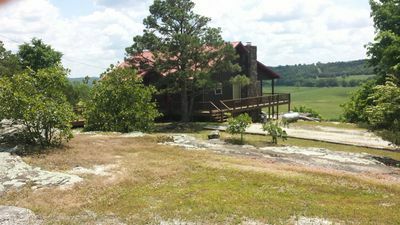 Rock bluff and view of pasture is visible from the very large elevated deck. Bannock lodge is a 4 bedroom (including loft), 3 full bath, luxury log cabin capable of accommodating 9. The lodge includes: 2 queen size beds, 4 twin size beds, and 1 twin-size sleeper love seat. Ideal for large families and groups. Fully appointed kitchen including a gas grill. Features a full size wood burning fireplace for enjoyment in colder weather. Located within minutes of all local attractions, but very private at the same time. Our River front cabin is located just down River from Anglers & Jacks Trout Dock near the town of Mountain View, AR. It is built on stilts and has a front porch that overhangs the beautiful trout water of the White River. The interior is 100% native cedar and cypress. The cabin has 1 queen bed and 2 pullout couches and can easily sleep 4 people. 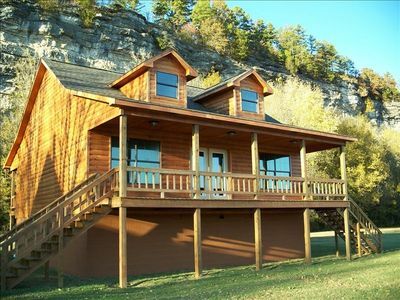 The cabin is less than 5 miles from the Syllamo Mtn Bike trails, Blanchard Springs Caverns & Loco Ropes. Stand up paddle board and kayak are ready for use and included in your stay for paddling in the nearby Syllamore creek. We have a 2 night minimum and a strict no pets/ no smoking policy. We have recently added a new home phone for local calls and wifi. This cabin is the perfect place to come to relax and watch the river roll by! This cabin is the perfect location for relaxing, fishing, floating, canoeing, rafting or exploring the Sylamore National Forest. Located across the River from Jacks Fishing Resort,Jo Jo's and Anglers restaurants which are also river access restaurants.Both resorts have guided fishing trips, boat, kayak, raft and canoe rentals. The Reel Retreat is 5 miles from town, zip lining, go carting and town square shops. The cabin has 2 wood burning stoves, 2 bathrooms, and 1 bedroom. There are 2 beds in the living room. The kitchen stocked with all necessary cookware, coffee pot/filters etc The kitchen also has a keurig coffee pot, microwave and amazing views of the river. There are two cable t.v. 's and high speed wireless internet available.The Ozark folklore museum has many pioneer actives, a wonderful restaurant and hosts festivals all year long. There is live bluegrass/folk music on town square, Pickin' park and other venues throughout the spring, summer and fall months. So many things to do in Mountain View and surrounding areas. Horseback riding, Mirror lake and exploring Sylamore National Forests and its many swimming holes. Sylamore Creek is located just minutes away and has swim areas, hiking and mountain biking trails. The Ozark folklore museum has many pioneer actives and live bluegrass on town square throughout the summer months. Blanchard Springs Caverns is home to cave tours led by the Forrest Service. The tours are underground and a great way to spend time during the summer as the temp in the caves is 58 degrees. There are trails for hiking and biking and much more. 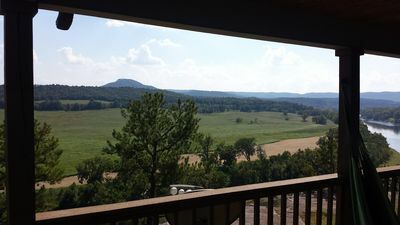 Mountain View is 1 hour from Heber Springs and 35 min from Norfolk Lake. CHECK OUT OUR LOWER WEEKNIGHT RATES!! !